The Link G4+ RX7Link (S6) RX7S6+ PlugIn fits the Mazda RX7 Series 6. The ECU PCB fits discretely inside the original factory enclosure. 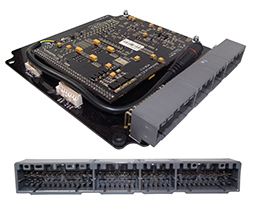 Installation of Link's RX7 ECU a breeze with no alteration of the factory wiring loom required. Factory features are supported - see Features for any exceptions. Includes oil pump control, single turbo only.